Diagram showing three lemon cells wired together so that they energize the red light emitting diode (LED) at the top. Each individual lemon has a zinc electrode and a copper electrode inserted into it; the zinc is colored gray in the diagram. The slender lines drawn between the electrodes and the LED represent the wires. A lemon battery is a simple battery often made for the purpose of education. Typically, a piece of zinc metal (such as a galvanized nail) and a piece of copper (such as a penny) are inserted into a lemon and connected by wires. Power generated by reaction of the metals is used to power a small device such as a light emitting diode (LED). The lemon battery is similar to the first electrical battery invented in 1800 by Alessandro Volta, who used brine (salt water) instead of lemon juice. The lemon battery illustrates the type of chemical reaction (oxidation-reduction) that occurs in batteries. The zinc and copper are called the electrodes, and the juice inside the lemon is called the electrolyte. There are many variations of the lemon cell that use different fruits (or liquids) as electrolytes and metals other than zinc and copper as electrodes. There are numerous sets of instructions for making lemon batteries and for obtaining components such as light-emitting diodes (LEDs), electrical meters (multimeters), and zinc-coated (galvanized) nails and screws. Commercial "potato clock" science kits include electrodes and a low-voltage digital clock. After one cell is assembled, a multimeter can be used to measure the voltage or the electric current from the voltaic cell; a typical voltage is 0.9 V with lemons. Currents are more variable, but range up to about 1 mA (the larger the electrode surfaces, the bigger the current). For a more visible effect, lemon cells can be connected in series to power an LED (see illustration) or other devices. The series connection increases the voltage available to devices. Swartling and Morgan have published a list of low-voltage devices along with the corresponding number of lemon cells that were needed to power them; they included LEDs, piezoelectric buzzers, and small digital clocks. With the zinc/copper electrodes, at least two lemon cells were needed for any of these devices. Substituting a magnesium electrode for the zinc electrode makes a cell with a larger voltage (1.5−1.6 V), and a single magnesium/copper cell will power some devices. Note that incandescent light bulbs from flashlights are not used because the lemon battery is not designed to produce enough electric current to light them. By multiplying the average current of a lemon (0.001A/ 1mA) by the average (lowest) voltage (potential difference) of a lemon (0.7V) we can conclude that it would take more than 6 million lemons to give us the power of an average 4320W car battery. Potato battery with zinc (left) and copper electrodes. The zinc electrode is a galvanized machine screw. The copper electrode is a wire. Note the labels − and + marked on the potato indicating that the copper electrode is the positive terminal of the battery. A short screw and nut connect the electrodes to the copper wires that have black and red insulating plastic coatings. Many fruits and liquids can be used for the acidic electrolyte. Fruit is convenient, because it provides both the electrolyte and a simple way to support the electrodes. The acid involved in citrus fruits (lemons, oranges, grapefruits, etc.) is citric acid. The acidity, which is indicated by the measured pH, varies substantially. Potatoes have phosphoric acid and work well; they are the basis for commercial "potato clock" kits. Potato batteries with LED lighting have been proposed for use in poor countries or by off-grid populations. International research begun in 2010 showed that boiling potatoes for eight minutes improves their electrical output, as does placing slices of potatoes between multiple copper and zinc plates. Boiled and chopped plantain pith (stem) is also suitable, according to Sri Lankan researchers. Instead of fruit, liquids in various containers can be used. Household vinegar (acetic acid) works well. Sauerkraut (lactic acid) was featured in one episode of the US television program Head Rush (an offshoot of the MythBusters program). The sauerkraut had been canned, and became the electrolyte while the can itself was one of the electrodes. Zinc and copper electrodes are reasonably safe and easy to obtain. Other metals such as lead, iron, magnesium, etc., can be studied as well; they yield different voltages than the zinc/copper pair. In particular, magnesium/copper cells can generate voltages as large as 1.6 V in lemon cells. This voltage is larger than obtainable using zinc/copper cells. It is comparable to that of standard household batteries (1.5 V), which is useful in powering devices with a single cell instead of using cells in series. For the youngest pupils, about ages 5–9, the educational goal is utilitarian: batteries are devices that can power other devices, so as long as they are connected by a conductive material. Batteries are components in electrical circuits; hooking a single wire between a battery and a light bulb will not power the bulb. For children in the age range 10−13, batteries are used to illustrate the connection between chemistry and electricity as well as to deepen the circuit concept for electricity. The fact that different chemical elements such as copper and zinc are used can be placed in the larger context that the elements do not disappear or break down when they undergo chemical reactions. For older pupils and for college students, batteries serve to illustrate the principles of oxidation-reduction reactions. Students can discover that two identical electrodes yield no voltage and that different pairs of metals (beyond copper and zinc) yield different voltages. The voltages and currents from series and parallel combinations of the batteries can be examined. The current that is output by the battery through a meter will depend on the size of the electrodes, how far the electrodes are inserted into the fruit, and how close to each other the electrodes are placed; the voltage is fairly independent of these details of the electrodes. Cross-section of a copper/zinc cell with a sulfuric acid electrolyte. The drawing illustrates the atomic model for the chemical reactions; lemon cells have essentially the same model. Zinc atoms enter the electrolyte as ions missing two electrons (Zn2+). Two negatively charged electrons from the dissolved zinc atom are left in the zinc metal. Two of the dissolved protons (H+) in the acidic electrolyte combine with each other and two electrons to form molecular hydrogen H2, which bubbles off of the copper electrode. The electrons lost from the copper are made up by moving two electrons from the zinc through the external wire. Zn → Zn2+ + 2e− . 2H++ 2e− → H2 . This reaction is called reduction. The electrons used in the copper to form the molecules of hydrogen are transferred from the zinc through an external wire connecting between the copper and the zinc. The hydrogen molecules formed on the surface of the copper by the reduction reaction ultimately bubble away as hydrogen gas. This model of the chemical reactions makes several predictions that were examined in experiments published by Jerry Goodisman in 2001. Goodisman notes that numerous recent authors propose chemical reactions for the lemon battery that involve dissolution of the copper electrode into the electrolyte. Goodisman excludes this reaction as being inconsistent with the experiments, and notes that the correct chemistry, which involves the evolution of hydrogen at the copper electrode but also can use silver instead of copper, has been known for many years. Most of the detailed predictions of the model apply to the battery's voltage that is measured directly by a meter; nothing else is connected to the battery. When the electrolyte was modified by adding zinc sulfate (ZnSO4), the voltage from the cell was reduced as predicted using the Nernst equation for the model. The Nernst equation essentially says how much the voltage drops as more zinc sulfate is added. The addition of copper sulfate (CuSO4) did not affect the voltage. This result is consistent with the fact that copper atoms from the electrode are not involved in the chemical reaction model for the cell. When the battery is hooked up to an external circuit and a significant electric current is flowing, the zinc electrode loses mass, as predicted by the zinc oxidation reaction above. Similarly, hydrogen gas evolves as bubbles from the copper electrode. Finally, the voltage from the cell depended upon the acidity of the electrolyte, as measured by its pH; decreasing acidity (and increasing pH) causes the voltage to fall. This effect is also predicted by the Nernst equation; the particular acid that was used (citric, hydrochloric, sulfuric, etc.) does not affect the voltage except through the pH value. The Nernst equation prediction failed for strongly acid electrolytes (pH < 3.4), when the zinc electrode dissolves into the electrolyte even when the battery is not providing any current to a circuit. The two oxidation-reduction reactions listed above only occur when electrical charge can be transported through the external circuit. The additional, open-circuit reaction can be observed by the formation of bubbles at the zinc electrode under open-circuit. This effect ultimately limited the voltage of the cells to 1.0 V near room temperature at the highest levels of acidity. The energy comes from the chemical change in the zinc when it dissolves into the acid. The energy does not come from the lemon or potato. The zinc is oxidized inside the lemon, exchanging some of its electrons with the acid in order to reach a lower energy state, and the energy released provides the power. In current practice, zinc is produced by electrowinning of zinc sulfate or pyrometallurgical reduction of zinc with carbon, which requires an energy input. The energy produced in the lemon battery comes from reversing this reaction, recovering some of the energy input during the zinc production. From 1840 to the late 19th century, large, voltaic cells using a zinc electrode and a sulfuric acid electrolyte were widely used in the printing industry. While copper electrodes like those in lemon batteries were sometimes used, in 1840 Alfred Smee invented a refined version of this cell that used silver with a rough platinum coating instead of a copper electrode. Hydrogen gas clinging to the surface of a silver or copper electrode reduces the electric current that can be drawn from a cell; the phenomenon is called "polarization". The roughened, "platinized" surface speeds up the bubbling of the hydrogen gas, and increases the current from the cell. Unlike the zinc electrode, the copper or platinized silver electrodes are not consumed by using the battery, and the details of this electrode do not affect the cell's voltage. The Smee cell was convenient for electrotyping, which produced copper plates for letterpress printing of newspapers and books, and also statues and other metallic objects. The Smee cell used amalgamated zinc instead of pure zinc; the surface of amalgamated zinc has been treated with mercury. Apparently amalgamated zinc was less prone to degradation by an acidic solution than is pure zinc. Amalgamated zinc and plain zinc electrodes give essentially the same voltage when the zinc is pure. With the imperfectly refined zinc in 19th century laboratories they typically gave different voltages. In the video game Portal 2, antagonist GLaDOS was embedded into a potato-battery-run computer for a significant part of the game. In The Big Bang Theory Season 6 episode "The Proton Resurgence", Leonard and Sheldon's childhood hero Professor Proton (Bob Newhart) attempts to show the group a potato battery, which amazes Penny. In the Bones Season 6 episode "The Blackout in the Blizzard", Angela and the other "squints" build a massive potato battery array in an attempt to power a cell phone. Illustrating the pathetically low output of such a system, it is successful for only a handful of seconds while using dozens of potatoes. In the episode "Lemons" of the television program Red Dwarf (tenth series (Series X)), the crew travel 4,000 miles from Britain to India in 23 AD in order to get lemons to build a lemon battery to power up their time machine's returner remote. In the sixth episode of the final season of Mystery Science Theater 3000, the main villain Pearl Forrester tried taking over the world using potato batteries, only for her plans to be ruined by Professor Bobo. In NCIS Season 7 episode 8, "Power Down", Abby Sciuto uses lemons as a power source for her stereo when she runs out of batteries during a blackout. In Terry Pratchett and Stephen Baxter's The Long Earth, the devices used to step from one universe to another appear to be powered by potato batteries. ^ a b Decker, Franco (January 2005). "Volta and the 'Pile'". Electrochemistry Encyclopedia. Case Western Reserve University. Archived from the original on 2012-07-16. Volta used silver, not copper, in his first cells; the chemical reactions involved in zinc/copper and zinc/silver cells are the same. ^ Snyder, Carl H. (2004). The Extraordinary Chemistry of Ordinary Things, with Late Nite Labs: Edition 4. John Wiley & Sons. ISBN 9780471588399. ^ a b Oon, Hock Leong (2007). Chemistry Expression: An Inquiry Approach. Panpac Education Pte Ltd. p. 236. ISBN 978-981-271-162-5. ^ a b c Goodisman, Jerry (2001). "Observations on Lemon Cells". Journal of Chemical Education. 78 (4): 516–518. Bibcode:2001JChEd..78..516G. doi:10.1021/ed078p516. ^ "Lemon Battery". Pembroke, Ontario: Hila Science Camp. Retrieved 2012-10-02. This webpage describes experiments starting with a single lemon cell that is studied with a multimeter, and then leads to a lemon battery capable of lighting an LED. Hila Science Camp has also posted a video showing how to build the battery and light an LED; see Create a Lemon Battery on YouTube. ^ "Lemon Battery Project". Burlington, Iowa: How Things Work Science Projects. Retrieved 2012-10-11. This webpage contains instructions for elementary school teachers. The project uses the voltmeter to show that the battery is working. A key element is that several pairs of electrodes are used (iron/zinc, iron/copper, as well as zinc/copper) to yield different voltages. ^ a b c Swartling, Daniel J.; Morgan, Charlotte (1998). "Lemon Cells Revisited—The Lemon-Powered Calculator" (PDF). Journal of Chemical Education. 75 (2): 181–182. Bibcode:1998JChEd..75..181S. doi:10.1021/ed075p181. Retrieved 2012-10-15. These authors note that hydrogen evolves from the zinc electrode. As described somewhat later by Goodisman, this effect is unrelated to the evolution of hydrogen that occurs when the cell is providing electric current to an external circuit; the hydrogen associated with these currents evolves from the copper electrode. 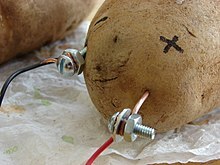 ^ "Potato Battery". Archived from the original on April 15, 2009. ^ Lisinska, G.; Leszczynski, W. (1989). Potato Science and Technology. Springer. p. 286. ISBN 9781851663071. ^ Kalan, Jonathan. "Potato power: the spuds that could light the world". BBC - Future - Technology. Retrieved 2014-01-24. ^ Heeling, Harmjan (May 12, 2012). "DIY vinegar battery lights LEDs for several days". ^ Head Rush - Sauerkraut Clock. The Discovery Channel. Sauerkraut is quite acidic due to the lactic acid produced during fermentation. The sauerkraut clock powers a digital thermometer in this video. ^ a b Abraham, Ann; Palencsar, Attila; Scherson, Daniel (Fall 2006). "Electrochemistry for K-12: The Potato Clock and Beyond" (PDF). The Electrochemical Society Interface. 15 (3). ^ Schmidt, Hans-Jürgen; Marohn, Annette; Harrison, Allan G. (2007). "Factors that prevent learning in electrochemistry". Journal of Research in Science Teaching. 44: 258–283. Bibcode:2007JRScT..44..258S. doi:10.1002/tea.20118. Full text by subscription only. ^ Sorey, Timothy; Hunt, Vanessa; Balandova, Evguenia; Palmquist, Bruce (2012). "Juan's Dilemma: A New Twist on the Old Lemon Battery". In Metz, Steve (ed.). Fuel for Thought: Building Energy Awareness in Grades 9-12. NSTA Press. pp. 91–98. ISBN 9781936137206. Guide to lemon battery experiments for science teachers, including both fabrication notes and educational outcomes. ^ Du, James (2011). "Fruit/veg batteries". A quantitative study of both the voltages and currents produced by fruit batteries; part of a larger project including "penny batteries". ^ a b Naidu, M. S.; Kamakshiaih, S. (1995). Introduction to Electrical Engineering. Tata McGraw-Hill Education. p. 50. ISBN 9780074622926. ^ Watt, Charles; Watt, John, eds. (1840). "Review: Proceedings of the London Electrical Society, 1841-1842 Session". The Chemist ; Or, Reporter of Chemical Discoveries and Improvements, Volume 1. London: R. Hastings. Of the application of this cell a very important modification can be arranged, by converting it into an ACID battery, analogous to the platinized silver of Mr. Smee. Those who are acquainted with the ingenious device of that gentleman, are aware that the characteristic of his arrangement is, that the negative plate, where hydrogen is released, shall part with this hydrogen very readily. Under ordinary circumstances, the hydrogen adheres very much to the plates of an acid battery, and throws a considerable portion of the plates out of the action, by its presence on their surfaces. To remedy this, he has, as he terms it, "platinized" the surfaces. ^ Hatch, Harris B.; Stewart, Alexander A. (1918). "History of Electrotype Making". Electrotyping and stereotyping. Chicago: United Typothetae of America. pp. 2–4. In 1840 Smee invented a battery which made electrotyping possible commercially. ... Perhaps one of the greatest forward steps in connection with electrotyping was made when the plating dynamo was invented. The first adoption of a dynamo, in place of the Smee type of battery, was by Leslie, of New York, in 1872. Primer for apprentices in the printing industry. Good short introduction to the history of electrotyping. ^ a b Sprague, J. T. (July 1, 1874). "Electro-deposition of Metals". The Telegraphic Journal and Electrical Review. II (34): 237–239. The Smee cell is the cell most commonly employed because of its extreme simplicity of construction and management. A detailed discussion of the construction and maintenance of Smee cells, c. 1874. ^ Scott, David A. (2002). Copper and bronze in art: corrosion, colorants, conservation. Getty Publications. p. 22. ISBN 978-0-89236-638-5. Some extremely important commissions were made in electrotypes, such as the "bronzes" that adorn the Opera, Paris, and the 320 cm high statue of Prince Albert and four accompanying figures, erected behind the Albert Hall in London as a memorial to the Great Exhibition of 1851. ^ The standard electrode potential is 0.76 V for both pure zinc and for amalgamated zinc. See Vanýsek, Petr (2012). "Electrochemical Series". In Haynes, William M. (ed.). Handbook of Chemistry and Physics: 93rd Edition. Chemical Rubber Company. pp. 5–80. ISBN 9781439880494. .
^ Noble, Mckinley (19 December 2011). "Portal 2 Science Kit Has Talking, Evil Potato GLaDOS". techhive. Retrieved 30 January 2015. ^ Keeling, Robert (19 October 2012). "TV Review: RED DWARF X Episode 3 'Lemons'". Starburst. Retrieved 30 January 2015. ^ Adam, Roberts. "The Long Earth by Terry Pratchett and Stephen Baxter – review". The Guardian. Retrieved 8 February 2017. "Maglab - Simple Electrical Cell Tutorial". US National High Magnetic Field Laboratory. Retrieved 2012-11-30. Description of an acid cell with zinc & copper electrodes, including a JAVA-based animation. The animation shows zinc dissolving into the electrolyte, electrons flowing from the zinc to the copper electrodes, and little hydrogen bubbles coming off the copper electrode. The animation also suggests that a single cell can light an LED, which is not possible for LEDs that emit visible light. Margles, Samantha (2011). "Does a Lemon Battery Really Work?". Mythbusters Science Fair Book. Scholastic. pp. 104–108. ISBN 9780545237451. Retrieved 2012-10-07. Online preview only. Lemon Battery video. Cool and fun animated video explaining in great detail how a lemon battery works from the inside. Orange battery video. The orange battery powers an inexpensive digital watch. Potato battery video on YouTube. Three potato cells in series power a calculator. This page was last edited on 11 April 2019, at 01:15 (UTC).